What is it? A sci-fi, online-only, persistent-world first-person shooter where you either play alone or join with friends as Guardians who explore planet environments, loot and shoot everything and unravel the story of a darkness that threatens the galaxy. From the creators of Halo, Destiny is neither a full-blown Massive Multiplayer Online (MMO) game, nor is it just a shooter. It sits somewhere in the middle as a title that borrows from both sides, leaving it somewhat unfocused. Despite its identity crisis, it delivers a solid, engaging shooter thanks to tight controls, levelling, fun special powers and weapon abilities/upgrades. Its stunning visuals will leave often leave you gawking at the scenery and snapping screenshots, while it also benefits from masterful music and sound design. It’s best experienced with friends and thrives on the experiences generated by exploring and surviving new worlds with them. It’s designed for you to run through fairly quickly, but stay for an extended period with additional challenges, online versus multiplayer and upcoming DLC (and it can definitely be expected that the game will evolve over time with feedback and updates) but don’t be surprised if you find it weaker or less focused on story content than you had hoped. 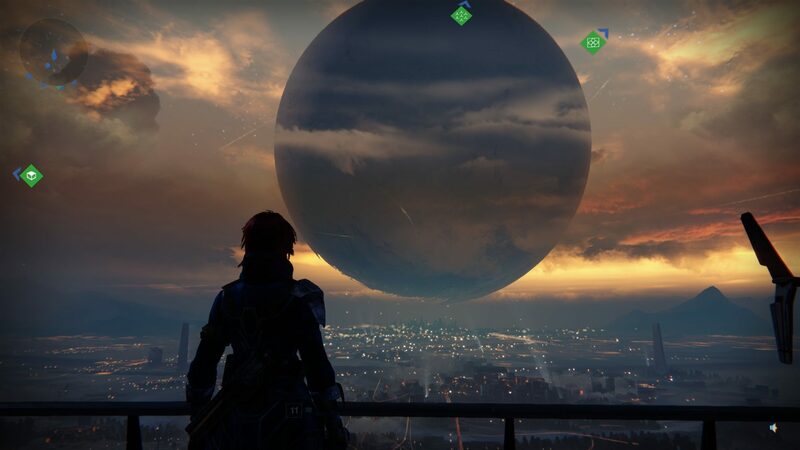 Destiny’s a little different to everything you’ve played, which can be both good and bad and there’s definitely room for improvement to the world and rewards systems, but we still had good fun with it and want to see where Bungie takes it next.